the path out of print. Half an inch from the south shore, a line is cast from nowhere, black dots, black dashes, almost north, almost parallel to the line of the Humber Bridge, red on green, half an inch to the left. The bridge is cut off by the ordnance grid. 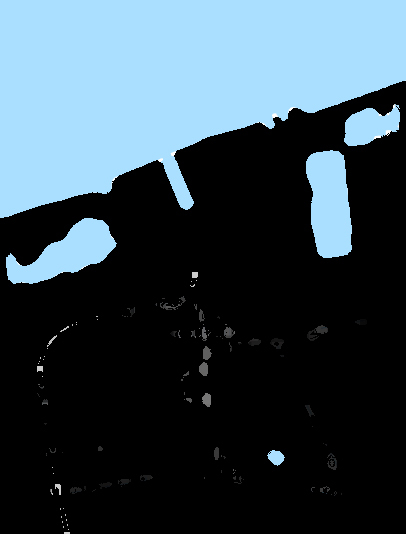 The dots and dashes float in a pale blue square, then crop out of the eastings, black marks in numbered space. A county boundary, trailing downstream through mud and sand, it terminates in a short hem, and neither end meets land. If I stare straight ahead from the south shore, I think, I will see the line on the water, if I stand here long enough, the lace will break the surface. I stare straight ahead. I see the silt that buffers the south shore and the settlements of the north shore. I cannot read the square that divides them. Overhead, a bank of cloud drifts in and out of the grid, smudging the scale, sapping the moon. The use is gone. The map folds flat. I snap out of it, there, Waters’ Edge is where I left it, an outline in the near west, soft lights, losing strength, the visitor centre, the road out, the recycled land. I can’t see the joins. The regular paving runs out beneath my feet and the path sheds a layer. I slow to take it in, I make adjustments, the east scraped back with each step, the track blanched and brittle. If there are signs, if there are warnings, I don’t see them. The light leaves the path before the path leaves the park. the mere, its white sails. After three hundred metres I pass between an outfall pipe and a sewage works. The outfall glints above the mudflats and breaks off at the shallows. It is somehow connected to the tanks, I see two or three diffusion drums behind a stand of trees. The works do not obstruct the path but they do make plain its unimportance. It is amenity, it is infrastructure, and it is the least of these. The path takes the line of the flood bank, left a bit, leaning into the foreshore, a brick works or tile works spreading out to my right, the perimeter set fast, dry ditch, steel palisade, pallet stacks. Behind the stacks, two chimneys, one broad, one thin, one dark, one darker. I close my eyes and make up the colours. The path turns right, the palisade turns right, and after fifty metres they lose each other, a left turn, I am level with the river again. A thickness of hedges and trees in the space vacated by the tile works. It is a screen, perhaps, an estate and its privacy. I don’t know this. I can’t know this, not without leaving the path. At three hundred metres the path and the bank and the trees break down. I slow for the remnants of an old sluice, the brickwork and gear-wheel, and if I stopped, if I stayed with it for a while, the light would fill in the details. Another path appears on my right, a flat grey line below the flood bank, again the separation, the trees extend the boundary. It is a companion path to the public path, I think, then I reject this, it is no companion. I save up the gaps in the boundary until I have enough for a profile. Inland water. On the map it is clay pits in the shape of a lake. The southern edge fills to the line of the railway. I glimpse a clubhouse, a boathouse, the boats in berths, on land, at rest. It is 1am. Everything is locked down. I slow again, one hundred metres east of the boathouse, and follow a short track to a concrete platform, which is empty, and a creek, which is choked with hessian sacks, plastic sacks, and plastic bottles. I mistake the platform for a car park, then remember the clay in the clay pits, there used to be a brickworks here, this used to be a wharf. 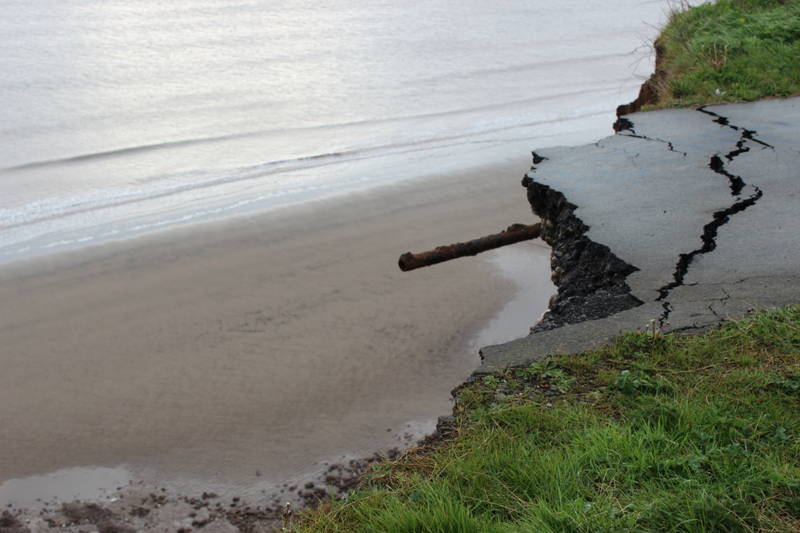 I stand at the lip, a clean drop to the foreshore, bits of timber and metal, the barges taken apart, nothing leaves the sediment. Close to the wharf is a concrete block, sunk in grass, a dull metal loop at the centre. I’ve seen these before, in pictures. An estuary swollen with barrage balloons, a passive defence against aerial trespass, anchored and tethered by iron rings and steel cables, of which only the heaviest, smallest parts survive. I return to the path, the eastern edge of the lake behind me, a green gap, a new lake, the nearside short. There is no boathouse, there are no boats. I pick out the lights of the north shore, sort the quick from the static, still Hessle, the last mile, perhaps the outskirts of Hull. The path skims the second lake, then a third, the sea wall makes an arc to the foreshore. I follow, losing sight of the lake, the landscape gets in the way, the trees fall back and I count twenty caravans behind the flood bank, lit by a single floodlamp. The path straightens out and the trees fall in line. Sound fills the left channel, the left ear, the left of my head, it has been rising for several hundred metres, a ragged pulse, steadying and slipping, over the water, Hessle or Hull, Saturday night, Sunday morning, heavy disco. The right channel is empty. Ahead, a gap where the ground should be. The bank is breached. This is the haven, the quay, the path on a landward turn, ninety degrees, working boats and leisure boats moored on the east side, the water low, the keels drying out. After a few minutes I reach the bridge, rail and pedestrian, single track, single file, an open crossing, no signals, no warnings. from the scrapyards of Hessle. I step off the railway and shake out the map. The information I need is cramped into a quarter inch with some other information and I can’t unpick it all. I take the only route available, the only road that I can see, the forty metres of track that leads to the wharfside. The wharf isn’t working and the lamps have been left on. There is an entrance to the left, marked for HGVs, and what appears to be an exit to the right, unmarked and gated. A small signage block sits between the entrance and the exit, a steel-framed rectangular panel on short stilts, white background, blue text, timber terminal in bold capitals, red symbol and explanation, yellow symbol and explanation, blue symbols and explanation. No smoking, no naked flames, safety helmets and vests to be worn on site. There is nothing to indicate a right of way and nothing that prohibits it, no symbols, texts, colours or posts. I take a left turn for the HGV entrance, passing a long, low shed with a brick base and a curved, corrugated steel roof, I see the cranes pitched over the wharfside. There is nothing that looks like a right of way. The vehicle gate is closed and I step to the side and around a heap of old tyres and pass a sign which is the same as the sign that I passed at the entrance. I look around. The wharfside is clear, the cranes are stood down. This must be where the cargo is unloaded, I think, where is the border. Ahead and to my right is the storage yard. The yard is divided into bays, a HGV’s width between them, there is extra space for loading and turning. In each bay, the timber is slotted and secured, the short pieces stacked in cubes, the long pieces laid in rows, all of it palletised, all of it strapped with plastic, wrapped, unwrapped, open to the night. Some of the stacks are numbered, a short code, I don’t know what it means. Country of origin, port of origin, article of tariff. 22, 38, 56. I make a small map in my mind, it has the shipments from Scandinavia and the Baltic states, international waters, maritime borders, the men stay with the ship, they don’t disembark, there is no touching. There is something missing. I think of making a new map but I don’t know how to finish it. I think of the yard and its penalties, the storage fees and the clearance fees, and I can’t see a way out of the wharf. It is just a wharf, I think, a soft terminal. I try to see past the cranes and the cargo and imagine a corridor that someone sketched earlier. I pass one bay, then another, the yard narrowing to the north, the docking platform falling away to the west, a new barrier rising in the east, large, bonded concrete blocks that I can’t see over or around, the passage is protected, the blocks run out, my breath restarts, and I find my place at the river. It is not the same place, it is not the same path. The moon has gone. The sky and the water do not reflect each other. A coarse grain sinks in the air, heavy and slow. The figments of the east are raked and sieved and I don’t know which side of the river the light is coming from. a path exhausting its chalk. As the perspective goes, so does my position. I have nothing to measure myself against. I try to compensate for the poor contrast by grazing the grass with my left foot, it doesn’t help, there is only darkness between the flood bank and the rushes. 2am. The moon reappears, in a different part of the estuary, minus its lustre, its finish. Bits of the foreshore break off in the corner of my eye. It is the property of the Crown, or most of it is, part of its coastal portfolio, I wouldn’t think it to look at it. The Crown Estate grants permissive consent for non-commercial public access along the foreshore. It has a prerogative right to lease and licence tidal land and seabed for port and harbours infrastructure, cables, pipelines and outfalls, and other projects. Each port or harbour has its own byelaws, a form of delegated legislation, and breaches are prosecuted in the lower courts. The path is uneven and maintained by use alone. If there was light enough I would step down to the foreshore, at my leisure, without claims. I must not leave the path. The path thins, the foreshore thins, there is light enough to pick out a few objects stuck to the south bank, a punctured football, an old tyre, a flagpole and flag, almost upright, I can’t identify the country. It’s a trap, I think, and why would I think that. The air has cooled slightly. A line of light has detached itself from the thick of Hull’s electrics, pulling away from the long, bright curve of the north bank; it is clear now, and close, the shape of a jetty, the line of a second terminal. Little by little, the path eases inland, still level with the foreshore, there must be a turn somewhere. Thirty metres from the terminal, the access widens to a concrete shelf, walled from the estuary, then narrows as it bridges an outfall drain. There are gates ahead and some dark masses to the rear. The path stops short of the gates and makes a sharp cut between the terminal and the drain. The terminal buildings fill the space to my left, separated by a steel fence, it is a single, jointed building, I realise, a warehouse with a multi-span gable roof. After two hundred yards, the site meets the railway and the path turns a corner, leftward, eastward, the warehouse slipping back. The trackbed is loose in its blanket, the embankment on a curve, and the path, now tarmac, glosses over a section of older, fainter rails that run beneath and beyond a set of locked gates. Ahead, to my right, a white signal box, Barrow Road, the tarmac around it cut and patched, and the white gates of a level crossing, manually operated, the road unlatched, the railway closed. the tollman in his cabin. I scribble a few lines on an A4 sheet folded to A6, things copied from signs, apparent certainties, naive speculations. I am writing in my own shadow and the words are on the slide. It is a night letter, to be memorised and not read, posted and not delivered. I fold the sheet inside the map and tuck the map inside my fleece. I take the map out of my fleece and trace a red thread in a blue-white square. I walk to the level crossing and back to the signal box. The port has several entrances, goods in transit, goods in storage, all of it is property and marked as property. I pick the least unlikely passage through the port, a long, straight road, flanked, on the right, by a long, grey shed. The road is cut in half by a one-armed swing barrier, which I tiptoe around. Each step is less certain than the last. There are few markings on the road, a black and yellow line, a broken white line. An unbroken white line runs ahead of me, inside left, turning as the road turns, I try to think of it as a defence, a legal defence, if I hold to the line and do not leave. The line passes other lines, thick, important lines, thinner lines, borders within borders. Some of the zones have arrows and stripes. I don’t look at the zones, I don’t enter the zones. There is a light in front of me, a control cabin at the dock’s edge, and a sound, a throat being cleared. I pass the cabin and follow the line between two warehouses. The road turns and the light dies behind it, there is a lack of clarity. I see crates and timber to my right and more warehouses further off. I see an unmarked path trailing through rough ground, climbing out of the silos and stacks, the fences come up on both sides, then fan out as the slope meets the foreshore, the map’s last square. and all the paths withdrawing. Terminal is the second instalment of a serial work; the first instalment is Sheet 112. An earlier version of Terminal was produced as an artist’s book for Trespass, an exhibition at SIA Gallery, Sheffield, 30 November – 22 December 2018. Some of the poems in Terminal appear in Uniformannual, which also includes contributions from John Bevis, Peter Blegvad, Kevin Boniface, Janet Boulton, Angus Carlyle, J. R. Carpenter, Rebecca Chesney, Les Coleman, Simon Cutts, Caitlin DeSilvey, Michael Hampton, Matthew Kelly, Cathy Lane, Phil Owen, Colin Sackett, Dawn Scarfe, Tim Staples, Gertrude Stein, Erica Van Horn, Ian Waites, Nathan Walker, Tom Wilkinson, and Ken Worpole. Click here for further details and to order the book. In a half-mile gap between North Lincolnshire and North Lincolnshire, there is a leftover Lincolnshire, a corner where three lines converge: heavy freight, passenger services, spinning from the west, the south-west, the south-east, slowing at the unitary border, the signals and their colours. A minute’s suspension on the curve, the flap of an unsealed envelope, one junction, then another, and the borough is made whole. The line draws level with Skegger Beck and the island platforms of Barnetby station. I step onto the north island, the footbridge rises, the track runs out of the frame, the footbridge descends, I step onto the south island. There is nothing south of the south island, no footpath, no exit. I undo each step, the footbridge rises, the footbridge descends. It is August, a Saturday, the evening piles up at the Whistle and Flute, spilling onto the buff paving. I pass out of the lane, the yellow of the NO PARKING grid repeating in the painted rails of the step-free access ramp; at the lane’s end, the dark timbers and clay-white curtains of the Silver Band practice hut. I turn left, a plain street, the King’s Road, one way out, exit north. Short terraces, redbrick semis, a few detached houses with gated driveways, and, set back from the road, batteries of post-war bungalows. Squat walls, blank fronts, hard landscapes. I take it in, let it go, surface after surface, glance up, the dusk is drawn through a mesh of overhead wires, the spokes of a utility pole. 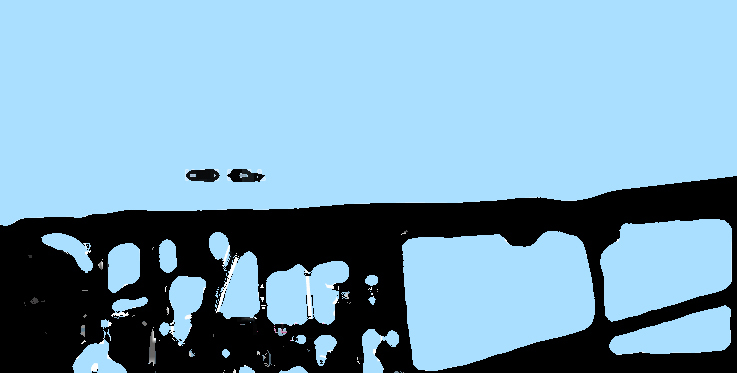 I make a diagram in mid-air, the lettered points of a compass rose, fifteen, sixteen, I start over, then stop, the divisions uneven, the directions at fault. The sky is incomplete. the blind cut to Gallows Wood. As I near the off-licence I begin to notice the little figures, less than human, propped against fences, waving from gardens, straw-stuffed dolls with outsize features. Some of them are familiar, the button faces of children’s animations, others I can’t quite place. Perhaps this is a local tradition, I think, decided here, in this street, one morning, and taken up, house by house: to stitch, to show. There are no signs, no banners. I cannot tell if the figures are in competition, if someone is judging them. There is no one to ask. The village sheds its volume, the terminal poles and corner bungalows, and the characters lose their scale, and I am at the roundabout, east of Gallows Wood, reflective barriers in dry, compacted earth, unmarked cars, branded vans. I am half out of my wits. The roundabout leads to an interchange, suspended above the M180, a footpath following the road link. The traffic merges and separates, high masts glossing the exits, fixed points on a flat spindle. I stop to read the pattern. The cars are going into the west, the light is going into the west. I leave the elevated section, crossing a two-lane slip road, ending up in a grass verge where the M180 becomes the A180, eastbound at a slant, Immingham, Killingholme. I cut through the verge and into the slack of a minor road, separated from the orbital junction by a small wooden fence, a dead end, dividing two fields, one fallow, one green, no buildings in sight. The road is straight, thinning as the contours rise, slight and gradual. A mouse, then only the sound of a mouse. I walk two hundred metres or so, and set my face to the west, to watch the light part with the land. each one in its fold. and blue is the last to go. I walk another four hundred metres, the road ends in a junction, there is no wind, there is a slight drop in temperature. I turn left. 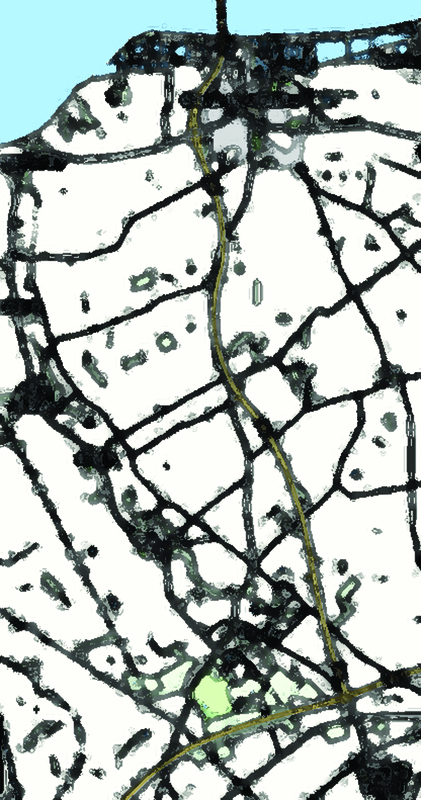 This is also a minor road, it barely darkens the map, a perforated yellow strip. Elsham Top. A plateau, not perfectly flat, the view of arable fields is interrupted where the curvature distorts the plane, and the wheat falls away to the wheat I can’t see. I pass an open-sided corrugated iron barn, machinery stacked at the rear, a white farmhouse at a quarter-turn, terracotta roof tiles, thick Leyland cypress flanking the gables, blind walls and privacy. When I look back, the farmhouse is gone. Each scene is dimmer than the last, copies of copies, uneven tones, corrupted lines. Eventually, the parcels of land on my left start to narrow and break down, and the dual carriageway moves into earshot. I pick out two gas pipeline markers at one end of a hedgerow, orange panels in precast concrete, then, at the other end, an aerial oil pipeline marker, white post, bright yellow roof, broad black stripe. A thin stand of trees tapers off to my right. The road seems to buckle and dip, its verges rising on both sides, a cutting or embankment, hollowing the lane. The shade swells up as the bend sharpens, until the cut is obscured. The bend softens and I make out the bulk of a short bridge, the A15 on its back, lying across the lane. Low clearance. The angle it makes is acute and the sides of the bridge do not line up when I move between them. Vibrations pass through concrete and into my chest. The lane continues as itself, and begins to climb out of the declivity. When I look up and over the verge, the sky has soaked up more of the dark grain, lumps of it adrift in the fissures, thirty degrees, clotting the zodiac. backlit in a shelving mass. The gradient relaxes and the verges lose their tilt. Sound from the dual carriageway is broken and not replaced. Elsham Top recurs in a left turn, which I do not take, winding back into itself. A few minutes later, another unmarked turn appears on my right, a new surface, brittle at the join, lighter in tone. The track seems to point to a handful of long, low buildings with pitched roofs, somewhere across the flat acres, but it is not clear how the track and the buildings are connected, and when I unfold the map and light up the grid, all I read is white space. I keep to the road, it is still empty, a telegraph pole in the left margin, axis without origin. The wires run to the next pole, then another, the intervals help me to measure the distance, and I think of graph paper, hoarded, unused, reams of blue-grey quadrilles, you could start anywhere. The poles branch out on a left turn, low voltage to the next village, a service drop in single phases. On my right, a small field has been impounded, concrete posts, barbs on the top strands, no cautions, no written warnings. When it is gone I see tiny crosshatched squares. There used to be an airfield somewhere around here, RAF Elsham Wolds, the records go back to December 1916, a primitive sketch, C Flight guarding the estuary, Spurn Head, Kilnsea, biplanes patrolling coastal batteries. At the end of the First World War the wooden huts and aircraft shed were flattened and the wold reverted to pasture. A second station opened in July 1941, west of the original site, a mile north-east of Elsham village. Three runways, three hangars, asphalt concrete hardstands, technical and maintenance areas, accommodation blocks, bomb stores, Bomber Command. 248 of the Elsham Wolds bombers were lost on operations: most of the losses were Lancasters. After the war, and the closure of the airbase, displaced Poles and Ukrainians, working at the steelworks in Scunthorpe, used the site as temporary lodgings; by the early 1950s, the land had again returned to agricultural use. The site is now bisected by the A15 and the eastern half is an industrial estate. I work it out from the map, some of it, the factory lanes and the slip roads, their deliveries and departures, and a double row of black dashes, the imprints of two runways, set down like compasses. A sharp left in the road, sending me west, the estates to either side secured by fences, the fences backed up by trees, sightlines ending in thickets and spikes. Another sharp turn sets my back to the village, and the fence on my left is gently let down, declining into scrub, the night showing through. It is a little after 10pm. As the concrete and mesh on my right are used up, the land is enlarged; a green verge, a green field, grazed and featureless, divided and squared by low wooden hurdles. The hurdles stretch to a row of buildings, dim cutouts under dull cloud, the wrong shape for agriculture. There is something in the foreground, limp against the roofline, a windsock or flag. I can’t make out the colour. The tract ends in a driveway, open to the road, that leads to Elsham Water Treatment Works. I understand this from a sign on the slate-capped entrance marker. The sign conceals an older sign, which I cannot read. Another sign indicates that CCTV is in operation. I scan the fence for security infrastructure and conclude that the fence is the security infrastructure. There are no cameras here, I think, no-one is making images. I pace the entrance, nostrils flared, straining to pick up something, chlorine or sulphate, scour or backwash, but the facility is silent, the air indistinct. I sip water from a bottle and leave the driveway. Concrete and mesh are realigned to the roadside, surmounted by flat-topped thorny hedgerows, and the treatment works are effaced. After two hundred metres I reach a crossroads, the contours coming on, the B1206 sliding back to the south, levelling off to the north. The north is for Barton and New Holland. I take it, while staring down the bend of another lane, north-east from the crossroads, which appears to skirt the base of a tall communications mast. I find the mast on the map, where it sits at the western edge of the former Elsham runway system, close to the site of the RAF control tower, demolished in the 1980s; at the height of the cold war, the tower relayed radar from an operations room near the mouth of the Humber to a RAF base outside Doncaster, the Elsham site being equidistant from the two stations. After it was decommissioned, part of the control tower was put to residential use; the ‘house’ was rumoured to be haunted. One by one, the exits fall back, and the B1206 sets its gradient to zero. I walk until I think I am level with the communications mast, all profile, now, above flat fields, though I am hardly any closer to it than when I stood at the crossroads. The map shows that the roads have diverged at an angle of 50 degrees, this will continue for the next few miles, there will not be a reconciliation. When the communications mast passes from view I am left without verticals. I know that the land to the west and the east is reserved for agriculture, the vergeside is all hedgerow, I cannot grasp the details. All I see is the shape of the plain and the line that divides it. There are vehicles, northbound to Barton, southbound to Brigg, the road lights up every few minutes, I try not to flinch at the glare, I try to find a niche for my feet. As my pace quickens, my thoughts slow down, until the frequency holds, a simple, steady beat, incidental to the journey, integral to the body, in step with the sound of cars, the lights of cars. I think of direction and speed, distance and time. I think of the course I set at the crossroads, the road flickering on a dial, between grid north and true north. I think that I make each place as I pass through it. The less I see, the more I make. I think this, then unthink it. The cars die out on the southbound lane and my eyes readjust to the night. Clouds disperse above the horizon. I watch the repairs taking place overhead, the moon in wait. As the first few stars are put back the depth returns to the sky’s edge. After a mile or so the road tightens on a curve, the cars are harder to read on the bend, and there are peaks of white noise in the east. I stop to unfold the map and work out my position. I am at a junction, there are degrees of separation, the B1206 crossing the A15, north-east to Barrow, the B1218 both feeding the carriageway and nursing it to Barton. Just before the junction, a few feet to my left, I see a gated turn, screened from the B-roads by a tall, ragged clump of bushes. The turn isn’t marked on the map and I can’t tell if it is a layby or a lane. I walk to the gate, and, finding it unlocked, enter the turn. There are no signs, no buildings, no infrastructure. It is less than one hundred metres from end to end, clean and straight, the north exit looping back into the B1206. I wonder if it is used by the police, if it is used to set traps. I walk on, the B-roads dividing, wheatfields spreading into the west, lodges and granges to the near east, the estates tucked behind trunks. The visual balance is lost at the junction, my left eye unanchored, my right eye blinkered. This continues for a quarter of a mile until both sides of the road are shuttered by trees. It is graft, light and sound are distorted, diffuse, I put my thoughts to one side and try to get through the blind bends and black straits. When I climb out of the last hollow, I find that the carriageway has closed in. Perhaps twenty metres to my right, separated by a steep bank, the cutting is in flow, lorries to the Humber, the parks and ports. The A15 dips out of sight and the fields take shape once more, lit by combines, their slow circuits, an edge put to an edge. At Beacon Hill, the B1218 bridges the A15, then embarks on a measured descent, the land holding itself in check. A slim belt of artificial light shifts between the lower slopes. The sky widens and the darkness is stepped down. Three wires run ahead of me, threading the insulators, wooden poles marking the way. I am smaller and lighter in this part of the grid, I know it will not last, the knowledge will return, a beginner, the loose leaf, then the clutter. On my right, at the field’s edge, a house with a red door, a red car, a red refuse bin. The security lamp burns out seconds later, the distance is relit, the contours cut off. I see the town falling into place, the Humber Bridge sticking out of the water, the faint red lights of the north tower, the clear red lights of the south tower. I see the image and the after-image, the town is doubled, Barton upon Barton, and then I blink back the error, set my face to the road. I pass a boundary marker, a police speed check sign, detached houses, long hedgerows, the hush, all of it trim, the pavement and the streetlight as one. The streetlights bunch up and the town is made easier to read, the night loses pressure, I try to imagine the houses in sunlight, I try to think of a colour. I keep to the right, past the turning for The Bridges, another turning for the leisure centre, there should be a museum around here, it is on the map, it is not on the street. A row of tall trees darkens the area to my right. I am on the edge of a park, the canopy brushing the streetlight, and I hear voices, somewhere in the grounds, and music, closer now, it comes and goes, the length of the park, three hundred metres. The trees continue without the park, beeches and limes, a rolling boundary of private property, iron spikes and shaved hedges. I glimpse the last of the B1218, the junction with the A1077, then let go, drawn into a side street, impulse or instinct. At the far end of the street, past the storied newbuilds and the artisan cottages, the small businesses and their parking spaces, stands a white-capped tower: dark, aged brick; white-framed windows, each with three narrow panes, divided vertically; and, above them, white-slatted windowless frames, the slats horizontal, tight and blank as ventilation grilles. From a distance, I’d mistaken it for an inland lighthouse; it’s only when I pass the neighbouring premises that I see the adjoining structure, a split-level extension that might be a restaurant or a small hotel. I make my way out of the side street and into the main street, and here is the tower, named as The Old Mill, converted, restored, a marker for a Marston’s complex at the eastern edge of the town square. I cross the old market place, a few people coming out of the chip shop, the pub, steadying themselves as they meet the night, its solidness, its suddenness. I leave the market at George Street, more takeaways and pharmacies, heading north along King Street, a florist, a baker, a grocer, the displays packed up, the awnings taken down. The streets widen at the next junction and the buildings assert their separateness, their heritage, something has preserved them. I turn left, then right, it adds up to north. Each street is quieter than the last. At the old Assembly Rooms I find a plaque, then count four more, blue plaques and green plaques, both sides of the road. I lean against the rust-red railings of the old schoolhouse and think that if I stand here for long enough I might learn something. A long, regular, residential avenue ahead, I have doubts, I cannot reconcile myself to the map. I walk up the avenue and call it north. When I reach the end, I turn left: another long, regular, residential avenue, willows hanging in the distance. Many of the properties have been given names, the lettering lined up beneath the gables, it is the same for each one, villa, villa, villa. The villas run out, and the willows run out, and the road wanders off in a scruffy meander, harbouring a short, unmarked service track, gated and locked. There is water, too, a fleet or a beck, I swear to it, though I can’t see it. I clip the meander and the streets open out, everything is set to north, the lights and the cars. I cross the bus bay to a blue bus shelter with no seats or service information, then step back from the shelter and notice a pole-mounted railway sign. It seems that the shelter is part of the rail passenger infrastructure, which also comprises a few steps and an unnumbered platform. I climb the steps to the platform and walk to the end and back. The terminus of a single-track line, it is less a station than a stop; there is no ticket office, no ticket machine, no waiting room. There is a metal bench, which I make use of, unshouldering my rucksack and leaning heavily against the backrest. Of the platform’s three overhead lamps, only one is working. I try to compose myself, then stand up, pace the platform and resettle, unable to rest until I’m certain that nothing is coming. I leave the terminus and head north for one hundred metres, stopping at a lit junction to consult the map, here the town divides, west from east, the haven widens to a harbour. I bridge the water at Maltkiln Road, then continue eastward, via surplus land, advertisements for surplus land, and a desire path at Tesco, rejoining the road at Barton Self Storage, a yard piled with flaking shipping containers, old pallets and portaloos, fenced to a height of four feet, the corners lit by low-watt bulbs. The compound fence runs the length of the adjacent site, Barton Broads static caravan park, the grey paintwork now green. There are new detached homes on my left, waterside developments, no through roads, thick parkland on my right, there are paths and lanes branching off, I cannot tell if there is a right of way. I reach the last of the houses and enter a new system, closed to vehicles, open to pedestrians: one-way lanes and zoned parking, white-barked trees in geometric plots, open grassland, and, at the end of the loop, facing out to the Humber and the Humber Bridge, a low-rise structure, glazed and canopied. There is light overhead, I read, I make notes. The park is a country park, Waters’ Edge, the land and the visitor centre are new, this was a brick works, then a fertiliser plant, then nothing, the soil contaminated by chemicals, idle for decades, before work began to strip it back, to excavate and start over. I walk out to the path that edges the bank of the estuary, the trickle and silt of Barton Haven below, the moonlight catching the mudflats, the east and its figments. eight points of a compass rose. An earlier version of this work appeared in the catalogue accompanying A Case for Place, an exhibition at Gallery Steel Rooms, Brigg, Lincolnshire, 12 May – 23 June 2018. My thanks to Linda Ingham for commissioning the piece. 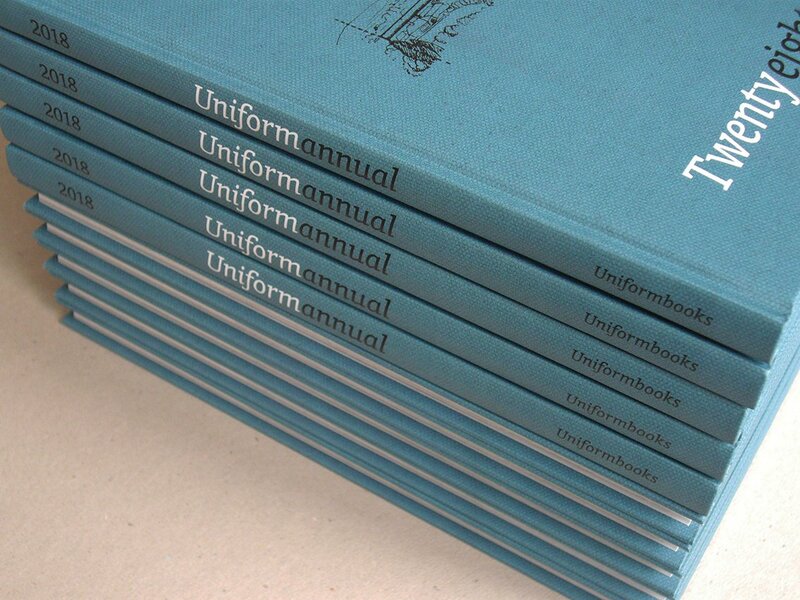 Some of the poems in Sheet 112 appear in Uniformannual, which also includes contributions from John Bevis, Peter Blegvad, Kevin Boniface, Janet Boulton, Angus Carlyle, J. R. Carpenter, Rebecca Chesney, Les Coleman, Simon Cutts, Caitlin DeSilvey, Michael Hampton, Matthew Kelly, Cathy Lane, Phil Owen, Colin Sackett, Dawn Scarfe, Tim Staples, Gertrude Stein, Erica Van Horn, Ian Waites, Nathan Walker, Tom Wilkinson, and Ken Worpole. Click here for further details and to order the book. the crowns abide in the air. Between the towns of Doncaster, Scunthorpe and Goole, less than 10 metres above sea level, 100 square miles of sparsely populated, predominantly agricultural land lie flat to the horizon. The low levels form the northern part of the Isle of Axholme, most of which belongs to North Lincolnshire, with outlying parcels in the East Riding and South Yorkshire. 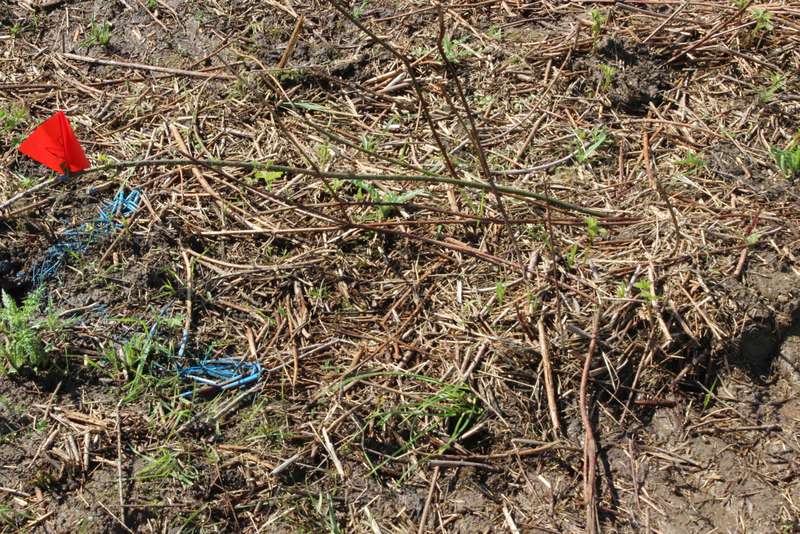 This reclaimed marshland is the setting of White Thorns, a sequence of poems that developed from several walks in 2016 and 2017. The area is bounded on the east by the Trent, and on the north by the Ouse; at Blacktoft Sands, the confluence of the two rivers forms the Humber. In the 1620s, the Dutch engineer Cornelius Vermuyden was commissioned to drain the low-lying land of Hatfield Chase, a process that brought an end to the ‘islanding’ (or flooding) of Axholme, and also transformed much of the surrounding landscape. As part of the drainage project, Vermuyden re-routed the rivers Don and Idle, creating a new channel, the Dutch River, to the north, with a terminus at Goole. The Stainforth and Keadby canal, opened in 1802, links the Don in the west to the Trent in the east; its course through the isle runs parallel to the railway line, just below the villages of Ealand, Crowle and Keadby. A third parallel is provided by the M180, shadowing the railway and canal at a distance of a mile or so, and, with the M18 (linking Doncaster to Goole), effecting a contemporary ‘islanding’ of North Axholme to the south and west. Since the middle ages, the area has been regarded as a source of fuel, with small-scale peat cutting on Thorne Moors preparing the ground for commercial extraction; by the 1980s, increasingly intensive methods had stripped large areas of the raised peat bog. A colliery – frequently troubled by flooding and faults, and mostly unproductive – also fissured the moors: the pithead was eventually demolished in 2014, and the resurfaced site is now home to a solar park. A few miles south, at Nun Moors, a 22-turbine wind farm stands at the edge of the Humberhead Peatlands National Nature Reserve. Six miles east, near Keadby, rising 90 metres from the flatlands, is a 34-turbine array; the largest onshore wind farm in England. 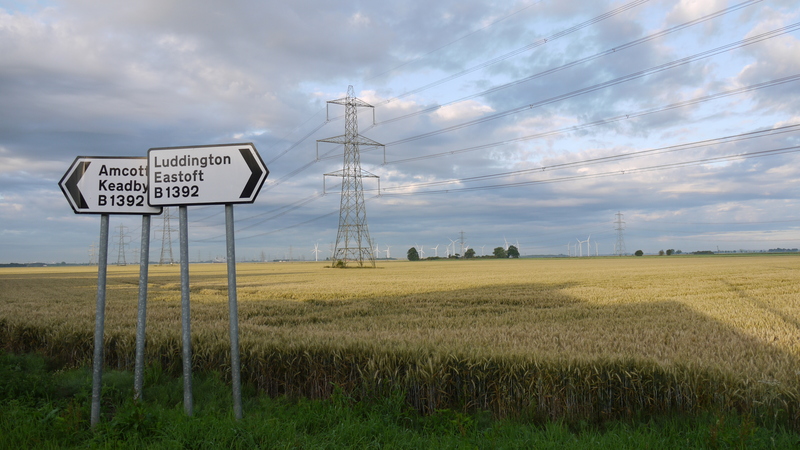 It’s a dynamic illustration of how the exploration and extraction of energy continues to shape this landscape, the wheeling mesh of towers, hubs and blades visible throughout North Axholme, from arable field to depleted mire. It also invites us to consider the expansion of the grid laid down by Vermuyden, its field lines and drainage channels criss-crossed by the remnants of a light railway (serving passengers until 1933, and the peat works until 1963) and, latterly, the buried networks of utility cables and pipes, while, to the south and east, the skies are latticed with power-lines, the net thickening at Keadby, where, between the Warping Drain and the power station, the pylons and turbines seem to meet and interlace, white compasses turning through grey parallels. I entered this grid through another: OS Landranger Sheet 112, which I studied before starting out, a new edition, the blank squares filling up with clustered blades. 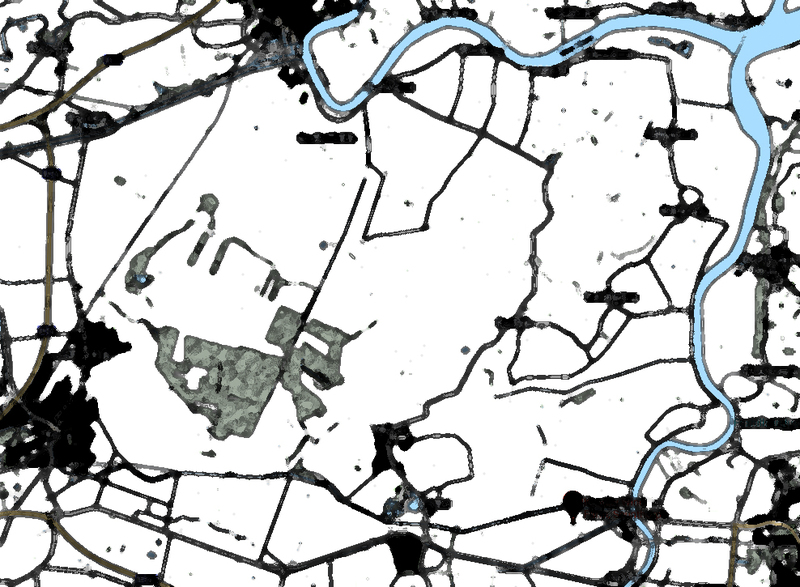 The walks began in Ealand, shortly after dawn on 25 March 2016 (Good Friday), and ended in Thorne around 15 months later, the last of these being an anti-clockwise tour of North Axholme, from dusk until the following afternoon. These weren’t so much linear or circular journeys as transits of a square, or squares within squares, the line (of towpath, track, or minor road) almost always straight, the direction (reset at each corner of the isle) undivided. At certain points in the walks – an intersection of canal and bridge, a chain of pylons making a 90-degree turn – my head would fill with right angles, some imagined, some real, rising out of the flat terrain and my unfamiliarity with the landscape. All this was heightened by walking at night, the senses manufacturing events from scraps of sound (waterfowl in the soak drains, the faint hum of an electric current) and patches of available light (the moon in the water, a signalman’s lamp), and always the filigree of infrastructure, the pylons and turbines compressed to a single plane, the distance collapsed, become abstract, then suddenly present, almost measurable, perception sharpened and distorted by turns, the mind filling in the blanks. a forest’s offcuts and husks. White Thorns is the second pamphlet by Brian Lewis (following East Wind, a sequence of lyrical essays and haiku, which appeared from Gordian Projects in 2015). 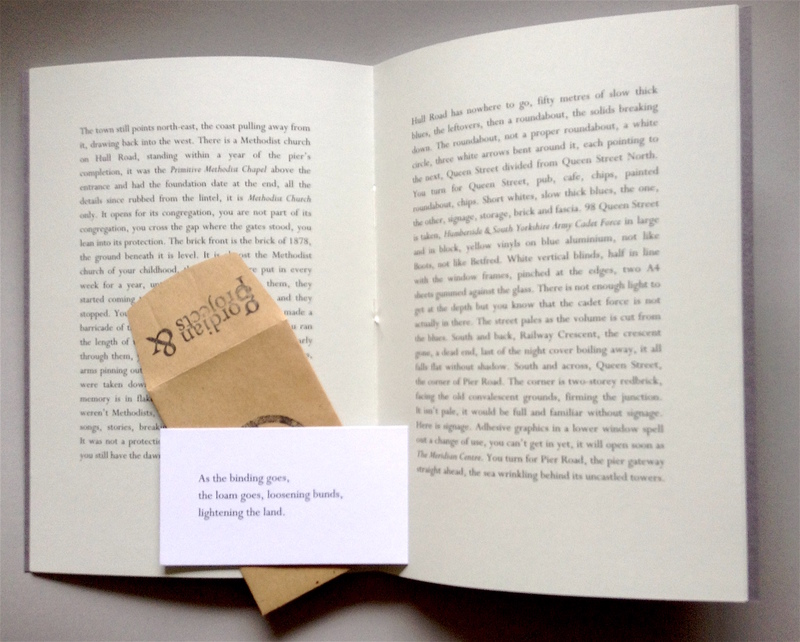 It is published by Gordian Projects as a hand-stitched pamphlet with hand-stamped covers, and comes with an individual poem, presented in an envelope as an artist’s multiple. Alternatively, you can order the pamphlet via the Gordian Projects site at the same rates. halt or hold the line. 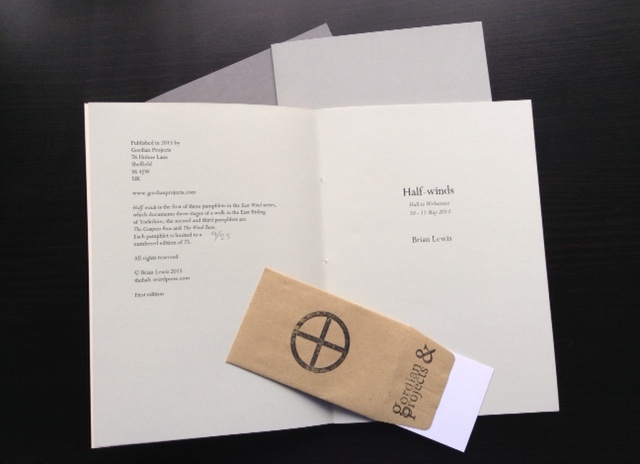 East Wind is a set of three hand-stitched and hand-stamped pamphlets containing a sequence of lyric essays and haiku that narrate a continuous 24 hour walk from Hull to Withernsea and Hornsea on 10-11 May 2014 (earlier versions of the essays appeared on this site between August 2014 and March 2015 under the titles Half-winds, The Compass Rose and The Wind Rose). Priced at just £10, the set is available now from Gordian Projects, and is limited to a numbered edition of 25. Each set comes with a extra enveloped haiku unique to that copy. More details here (update: please note that the limited edition set of 3 pamphlets has now sold out; a limited single-pamphlet edition will appear in January 2016). A full-length collection of poems and lyric essays, provisionally titled Eastings, is due to appear from Gordian Projects in late 2016. The poems and prose in the book are informed by several years’ walking around the east coast of England, from the Thames estuary to the Humber estuary. Two recent sequences of poems, Lych-gates and Wichel, shift the focus to south-west England. A mile of coast, leasehold and freehold, blocked out in the west, clean lines along the flat sheet. To the south, The Willows; to the north, Withernsea Sands. The park is not a public park, it is a retirement camp, hedged and fenced, orderly plots, concrete stops the drift into back country. The centre of the camp is left blank. The caravans look through the town, facing front, letting go of the east. A mile of sands, staked from end to end: the stakes make up the groyne fields, every hundred yards a forced beach, timber sticking out of the sea wall into the sea. It is the town’s measure and protection. At the north end, as Waxholme Road is bent inland, the waves sink the timbers, the waves sink the field lines. The town doesn’t move. Another camp is settled next to Withernsea Sands, Seathorne, an overspill, the camps divided by Waxholme Road. Seathorne is not on the town plan and has no revetments to the east. 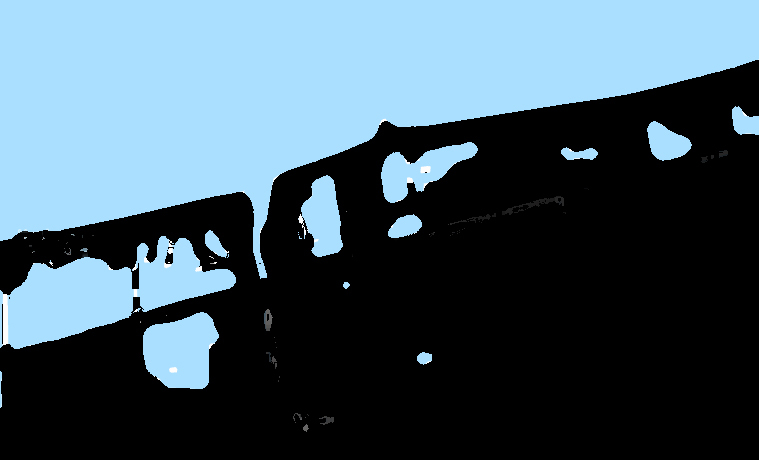 For every position held by a caravan, two lie vacant: grey-green gaps where the chassis used to rest, a caravan’s width between them. It is not enough to make rank. This is the first section of the third and final account in the East Wind series. You can read the full text of The Wind Rose on Caught by the River. An extract from the first part, Half-winds, appears here; an extract from the second, The Compass Rose, appears here. The complete texts of the East Wind series, with additional haiku, are now available in a limited edition set of three hand-stitched, hand-stamped pamphlets from Gordian Projects. Click here for more details. In 1854 a line opened between Kingston upon Hull and the North Sea coast. The Hull and Holderness Railway made the village of Withernsea a town, a terminus, and, in the decades that followed, a popular resort, the branch line drawing visitors from port and plain, through Keyingham, Ottringham and Patrington, villages that remained villages. A grand hotel, later to become a convalescent home, appeared shortly after work on the railway was completed, known as the Station Hotel, then the Queens Hotel, at the junction of Queen Street and Station Road. The pier followed in 1877, its beached turrets forming a seafront entrance, gating the shore. A straight line from rail to sea, a gain of 1196 feet from promenade to pier’s end: a terminus beyond the terminus, a line extended beyond the land. In 1880, 1882, 1888 and 1893, this line was broken, the pier breached and diminished by storms and storm-wrecked vessels, the last of these, the Henry Parr, shortening the pier to 50 feet. By 1903 it was gone, sea and land divided, a new wall on the front. Then wire along the waterline, the summer of 1940, one thin barbed roll stretched out on the sand. Armoured trains arrived later that year, fortifying the town and the weak cliffs to the north, laying down ditches, anti-tank blocks and pillboxes. Soon the war receded and the defences were left to themselves. The seaside resettled its visitors, threading back along the branch line, until 1964, when the passenger service was cut and the line went dead. This is the first section of the second account in the East Wind series; an extract from the first account, Half-winds, appears here. You can read the full text of the third and final account, The Wind Rose, on Caught by the River. 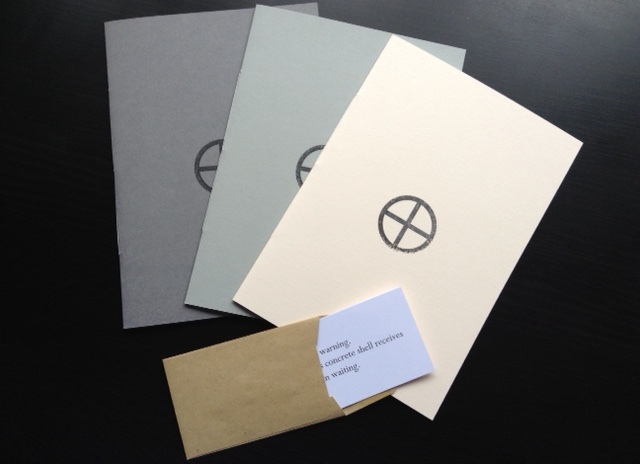 The complete texts of the East Wind series, with additional haiku, are now available in a limited edition set of three hand-stitched, hand-stamped pamphlets from Gordian Projects. Click here for more details.